Bring your family and four-legged friend to this dog haven exclusively for dog owners and experience the great outdoors. 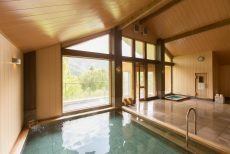 Rejuvenate your tired body at the hot springs provided in every cottage. With a new cottage launched in February 2018 that has a dog run, your pet can now have untethered fun in an open space. Keep warm with the fireplace in the winter and cook up a storm at the barbecue pit in the summer to spend a comfortable time with your loved ones. A fine selection of Japanese dishes await guests at Hotel Ambient Azumino, with only the freshest, seasonal ingredients from the Azumino area used. Enjoy Hotel Ambient Azumino’s exquisite French cuisine, with the finest ingredients sourced from the Northern Alps and Shinshu area. Sumptuous food can be provided at our cottages and you will be spoiled for choice with the different menus each offering mouth-watering local flavors. 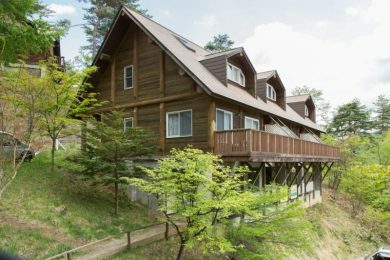 Relax in complete privacy at your cottage where a personal onsen awaits. Drawn from Ariake Onsen, the alkaline waters will soothe your muscles after a long day. Please note dogs cannot enter the hot spring itself. Access to the main hotel facilities is just a moment away, including hot springs, spa services and restaurant facilities. Model course showcasing the best sightseeing spots around Azumino.